Grand Strategy of the Authoritarian Axis: How Will the West Respond? Recent events – like those in Syria – show increasing coordination among some of the world’s most dangerous states. Once subtle in the making, we are watching the unfolding of a dramatic shift in international politics. Why, we may ask, is this happening? When the Soviet Union collapsed, no major power emerged to challenge the United States and the West. Simply put, for two decades policymakers failed to define a grand strategy to govern its foreign policy. Washington, in effect, enjoyed a “free ride” in conducting its foreign policy. In moving from crisis to crisis without an overarching set of goals or principles to guide its policies, the U.S. and the West have lost strategic momentum. Simultaneously, a new bloc of states – an “authoritarian axis” – is gaining strategic momentum. Dangerously, this rival bloc is mounting serious geopolitical resistance to the West and altering the balance of power. Recent matters only make this new alignment of states all the more clear. Recently, Russia and China vetoed a third UN Security Council Resolution to impose sanctions on Syria for attacks that have killed thousands of people. Due to axis coordination, Russia and China consented to another watered down UN resolution. A recent suicide attack on innocent civilians in Bulgaria, which U.S. official’s claim “had the characteristics of an attack by Hezbollah,” only points to Iranian involvement. This rising concert – Russia, China, Iran, North Korea, Syria, and Venezuela, among other states–shows increasing evidence that their foreign policies are aligned, which is not to say perfect or near-perfect alignment. Now, more than ever, the West must ask itself two simple questions: Has the axis put into practice a coherent, if still evolving, grand strategy, and will this create an effective counterweight to the U.S. and the West? For the West to understand the gravity of this shift, we must consider what principles animate the axis grand strategy, its strengths and weaknesses, how effective it is, and can the West counteract it? To be clear: the rise of the axis is the most momentous development – if not the fundamental shift — in geopolitics in recent history. How well the West deals with the axis grand strategy will determine the tenor of world politics — whether peaceful or confrontational – for the next generation. In foreign policy, the authoritarian axis follows several unifying principles that produce highly coordinated policies. In practice, these policies provide the foundation for a unified grand strategy against the West. First, axis states routinely oppose and resist the policies and actions of the U.S., the United Nations, and its allies. No better examples exist than their policies toward Syria or Iran. They actively resist the West whenever it moves against or otherwise seeks to restrain other axis states. Attempts to impose sanctions, whether against Iran or Syria, generate sustained opposition from the axis. Second, the axis grand strategy aspires to undermine the values and influence of the West. Initially, its grand strategy organized opposition to U.S. policies, until President Putin redefined the axis grand strategy. Before a meeting in Moscow of Russian ambassadors, Putin pronounced in highly charged and provocative language the West’s decline. Warning that, “domestic socio-economic problems… are weakening the dominant role of the so-called historical West,” Putin’s strident words shifted the attack from the United States to a broad condemnation of the U.S. and the West. Putin’s criticism of the West signals a remarkable shift. Only several years ago, commentators hoped democracy would flower in Russia, Iran, and Syria – perhaps in China, too. Strategically, focusing on the West encourages states in the authoritarian axis to attack freedom and democracy, free markets, and human rights. Third, the axis grand strategy, which is hostile to liberal political values, is dangerous precisely because it promotes and legitimizes authoritarianism. Such governments rightly fear that democracy, freedom, and liberty directly threaten their power. If this principle sounds counter-intuitive, recall that what all of these states share are highly repressive, authoritarian governments. These states also share, if we exclude China, totally dysfunctional command economies, which survive from revenues generated by oil and gas exports and military sales. Fourth, the axis grand strategy, by actively opposing the West, seeks to encourage self-doubt, perhaps fear, in the West that it is, once again, under assault from authoritarianism. While it has been two decades since the West worried seriously about confrontation, the axis seeks to undermine the West’s confidence and sense of security by acting in unison to oppose, through overt and subtle means, the West’s values and policies. Regrettably, democracies are vulnerable when the public believes that some states conspire to undermine their values and institutions. Fifth, the axis grand strategy works, aggressively when necessary, to protect its members. Directly put, the axis seeks to maintain the number of authoritarian states – at all costs. While we see more democracies today than at any time in history, the axis states likely understand how profoundly vulnerable they are to revolutions. Predictably, the axis grand strategy elevates the principle of preserving like-minded authoritarian states, while the West naturally wants to see more democracies. Axis states may be optimistic that they can “grow” the number of authoritarian states – or at least maintain those already in the axis. The strategy of preventing the West from destroying authoritarian governments explains precisely why Russia, China, and Iran actively support Syria’s authoritarian government even when thousands of civilians are dying. This logic works in the opposite direction. If the axis states can prevent the West from encouraging democratic opposition movements, say in Syria and Iran, the number of authoritarian states might increase. For example, without Russia’s political and economic support, Belarus likely would collapse and fall out of Moscow’s firm grip. If the axis could prevent the West from intervening in such states as Libya, where an opposition movement destroyed Libya’s authoritarian government, it could halt democratic revolutions. 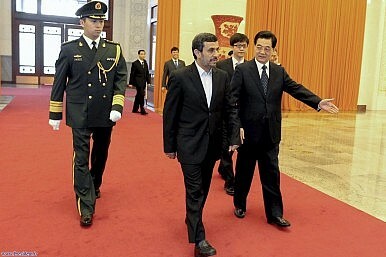 China’s Syria veto at the Security Council was no surprise. Richard Weitz looks at what Beijing might still be willing to do.